I have seen some really good thinking about, and references to, Art in the blogs over the past couple weeks. I'm talking about big, wide, fundamental-concept-level discussions about Art. Then, yesterday, via Facebook, I learned of 2 additional offerings on Art. Frederick Gibson, another deep-thinking Objectivist architect, posted What is Art? From Denis Dutton's "Art Instinct" over at the brand new site Lifestyle Dimensions. This brief review of The Art Instinct: Beauty, Pleasure, and Human Evolution is the first installment of a series on different chapters from the book, and gives some very interesting insights on the internal process one goes through in the 'consumption' of a work of art. Finally, Diana Hsieh posted Ready for the Day at NoodleFood, wherein she describes a print she had recently purchased and just taken delivery of. I love how she describes why she chose this particular work, and what it means to her. It is a great concretization of the descriptions of Art from the other posts. My art form of choice these days is typically classical music, specifically, Beethoven. To me, his works are the presentation of a world that is perfect, uncompromised, and heroic. Some of his works are tragic, but many more of them are loving, uplifting, and benevolent, if not grand and triumphant. For tonight's menu, let's discuss Art. Appetizer: What is your art form of choice? (You may have more than one.) How does your favorite art speak to you? What are your favorite specific works of art? Drink Special: What was the last art event that you attended, or a special event that made a lasting impression? (Concert, museum, theatre, etc.) Think about your enjoyment of that event. How did it make you feel? What did you get out of it? Happy Hour will take place from 9-10 p.m. Eastern and 6-7 p.m. Pacific, at the new OList Chatroom. Check your OList email for the login and password. For the past few years I have been making my Thanksgiving turkey in the Weber grill. It is so easy, and makes the most delicious bird ever. The page is password protected, and the login and password will be announced on the OLists. You can log in really easily through Facebook, and the chatroom that Diana has set up is really easy to use. And, the OLists chat room is open 24/7, so should you wander in there at any time during the week, you might find some other OList friends there to chat with. Not subscribed to any of the OLists? Want more info? Check out http://www.olist.com/ for descriptions of all the lists. Many of the lists are open to non-Objectivist lurkers, and lurkers are welcome to participate in the weekly socials. See you Sunday morning on the chat! This is one of my favorite fall/winter dishes and I could easily enjoy it weekly without tiring of it. In fact, I'll probably be making this again in the coming week, and will update with pictures at that time. Reepicheep's Coracle had another interesting post this week, which was part of the Objectivist Blog Carnival. The topic was optional values, and the post was Why Reading Medieval Latin is Central to the Purpose of the Atlanta Objectivist Society. A lot of times, the focus of an Objectivist club ends up on philosophy. Lectures, book discussion groups, and political arguments are par for the course. And there is nothing wrong with those things, of course. But if these clubs are going to be a real social network for the members (kinda like the social network of a church is my goal), there must be room for people to do optional values together... Basically, our idea is that if you are gonna watch movies or conjugate verbs, why not do them with like-minded people? ...as we all know, once you have read the Bible together and cracked jokes about Tolkein and South Park based on Latin, you have really forged a bond. Appetizer: Optional Values include hobbies, side interests, and the like. What are your optional values? How do they support your primary or fundamental values? What is it that draws you to a particular interest that you have? Is it intellectual? Physical (like a sport) or other? Drink Special: Are your optional values primarily social or are they more solitary? What outlets do you have for participating in them? Do you belong to a club or group for it/them? Starting with Sunday's OLists Brunch, we will be moving the OLists Socials away from Twitter and onto a new, password-protected chat space. Watch your respective OLists for more information! Finally, I have a great excitement to report from the construction site in Tennessee! Since I left, they have laid flooring, and worked on the painting, which is all important work and nice and all, but there hasn't been anything as exciting as the massive beam framing and steel welding and all that was happening before. Until this week, that is. Over the past few days as they have been working on the fireplace. 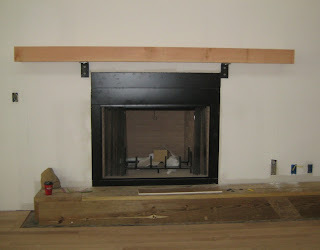 You may recognize the mantle from that day a couple months ago when I rejected one of the beams. Well, the ugly duckling beam has transformed into one beautiful swan of a fireplace mantle. Tuesday Night OLists Happy Hour: 2010 Election Special! By the time our weekly #OLists Happy Hour rolls around tonight, the polls will have closed in the East and will be about to close in the West. Due to the timing of the polls closing, and to give everyone a chance to vote and still make it to Happy Hour, and because I think there could be some particularly interesting discussions, tonight's Happy Hour will be 2 hours, from 9-11 p.m. Eastern and 6-8 p.m. Pacific. As the returns roll in, let's get a read on how things unfolded around the country, from a first-hand, #OLists Happy Hour perspective. Join us and weigh in on the elections, the races, and share what was important to you in all of it. Appetizer: Did you vote? What race/s were important to you in this election? Were there any particular races you abstained from voting in? How did your favorite candidates fare? Drink Special: Did you campaign for any candidates this year? Whether or not you did, would you consider doing so in future election cycles? Were there any particular aspects of this year's elections that impacted, changed, or challenged any of your views of our political system?